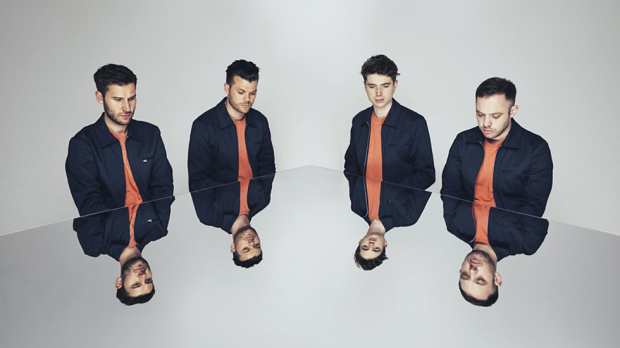 Manchester based four-piece band Everything Everything are bound for a well-awaited return to Australia, joining the bumper line-up for Falls Festival 2017. The indie-rockers known for their explosive melodies and topical lyrics will hit Australia’s live-music scene later this year with the new music from their latest offering A Fever Dream. Reigning in the chaos and complexities of 2015’s Get Me To Heaven, they’ve followed up with an album that embraces a human empathy to the absurdity of our times. From his home in Manchester, lead singer Jonathon Higgs had a chat to SARAH DAY about approaching album number four and the style and execution of his writing process. What is A Fever Dream, and how did that come to be the title of the new record? I was trying to think of a way to talk about a feeling that the last few years I’ve had and what it seems that a lot of people have been feeling. There’s been more than a couple of major events that have affected people, affected our society, and a lot of people seem to feel just very dazed by it. That kind of shock still hasn’t really lifted; people can’t really believe what it’s like now. I thought that was a good, short way of sort of talking about that I guess. How does A Fever Dream differ thematically as a follow up album to Get Me To Heaven? Well, Get Me To Heaven was more of a warning vibe, I was talking about a lot of ways that somebody could appear and take power, that was one of the big themes like corruption and false idols I guess. It covered the fact that things seemed to be heading towards something and this records sort of less about talking about the events themselves but more the feeling and aftermath. I guess there’s just a lead up to something and then there’s the reality. Get Me To Heaven got quite a lot of air time on Triple J here in Australia, are you excited to see how fans in Australia respond to the new music when you perform live? Oh mate, I can’t even tell you, like, we see the Triple J Twitter-bot firing off every time they play our song and it’s absolutely loads. We get a lot of Australian buzz just from people saying come over, come over — but yeah it’s kind of crazy we haven’t been over there a lot at all, I can’t wait to see the reaction. How does performing at the larger festivals compare to your more intimate gigs, do you have a preference? Well it’s a weird thing, if you do a whole run of festivals then all you want to do is play in a little dark room and play all your weird songs. At a festival you tend you play all your big hitters but at a smaller gig you can play something a bit weirder and take the mood up and down and make more of a story out of it — at a festival it’s a bit like a machine gun, it’s all our supposed hit songs. It really depends what you do but I like them both. It’s good to have a mix and we do have a few of our own shows coming up as well so that’ll be nice. We have got a round of sideshows around Falls. What inspired the more toned down approach for A Fever Dream? I guess we felt we didn’t want to repeat ourselves. On Get Me To Heaven you can feel that at the time it was a really tense build up so with this we really all just wanted to capture a kind of feeling of aftermath. It was really easy compared to all of our records so far. We were working with James Ford and he had a really good sort of sense of shape for what to make and what would go with it, how heavy to go, how soft to go, so that kind of shaping of the record was really important. What kind of music were you and your bandmates listening to when you were creating A Fever Dream to get yourself into the right head space? Alex our guitarist, he was listening to a lot of Warp Records like from the early 90s — that was all like all that early dance stuff, he was really into it while he was writing a lot of the songs. We were listening to a lot of music that made us feel good from our youth. Some heavy guitar bands like Nirvana, Smashing Pumpkins, stuff like that, just feeling relaxed about the music and not trying to worry about making it too complex. We just wanted to write something that felt a bit more soulful. Do you have a personal favourite track from the record that you’re really excited to play at Falls Festival? I really like playing A Fever Dream the song, just because of the way it kind of grows and builds from a piano bit into a big dance, which is new for us so that’s really fun to play. Are there any acts you’ll be particularly keen to catch between your sets at Falls Festival? I think we’re definitely going to try and see Liam Gallagher (laughs). Maybe Fleet Foxes, I’ve never seen them live. You predominantly wrote the lyrics for A Fever Dream in the studio; do you get inspiration to do much writing when you’re on tour? Yes we do a lot of music writing, I don’t write so much lyrically on tour — lyrics kind of come anytime, anywhere. It’s that sort of thing where you might hear somebody say something, or you might just have a thought. I just put a note down in my phone when that happens so I just have this collection of notes. You’d surely have quite a lot of backlog of writing on your phone then, do you often go back to any old material and use that for recording? Yeah I do actually, it’s massive — I come back to them later and look to see if some of them chime with each other. I actually broke my phone earlier this year and I lost absolutely tonnes of what I’d written between records and I kind of just liked it actually. If I don’t remember them then they’re not good, if a song comes back to me and it’s the same then it was good but I don’t really care you know; it’s kind of liberating actually. Your lyrics are often inspired by political events and happenings around the world — what draws you to writing about this type of subject matter? Well I don’t really seek it out in what I listen to; I don’t like it when it’s too obvious. What draws me to it though is just that that’s how I think and I don’t want to write a lie, I just want to write my thoughts. A lot of these things really affect everyone, it’s things that everyone’s thinking about so why not sing about them too? I don’t want it to necessarily be all about that though; I want it to be more like, this is how we’re all feeling. It’s just something that we can all relate to, something to communicate to people really. You’ve noted that the song Ivory Tower is your reaction to all the negative things going on in the world. Can you explain a bit more about what inspired you to write that track and what the lyrics “I can think of nothing else but this machine,” refers to? Well that song’s really about the Internet, comments, and Internet manners really — like how discrete people can become when they’re shouting at each other on the Internet and this kind of removal of the normal rules of society. A lot of the lyrics are talking about racism and people being racist online — I tried to write it as ambiguously as possible so it would come across like you were reading comments almost. That line about “I can think of nothing else but this machine,” it’s actually written on the fifty-pound note in Britain. It’s a quote from Watt who invented the light bulb, when he’s talking about the locomotive; anyway I really liked it, and I really liked that you’d know that line if you were really rich, you know, carrying around a fifty pound… No one has that much money unless you’ve come straight out of a bank or something. It was kind of making a comment on the rich, but I liked that it sounded exactly like what I was thinking, about how money keeps all these things turning over.